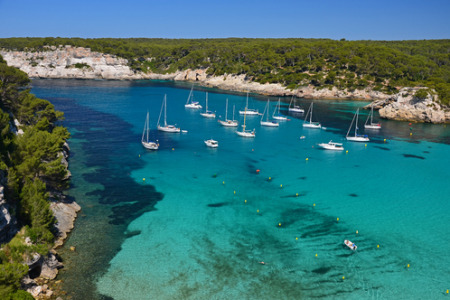 Cheap Cala Galdana holidays take you to one of Menorca's beauty spots on the southern coast west of Mahon. Surrounded by cliffs, this wide sheltered bay with sun-bleached sand and the clearest of waters is definitely the place for beach lovers. Please note that the main beach is accessed by steps and strong legs are needed so it's not ideal for buggy toting families. There are however several wonderful beaches in the area where access is easier. Long days of summer sunshine. With a guarantee of long hours of hot sunshine throughout the summer season which lasts from April to October, it is no surprise that Cala Galdana holidays are popular with sun-starved Brits looking for a relaxing break. The sand is perfect sand castle material and the calm shallow waters are great for paddlers and young swimmers needing to gain confidence. The quality and range of hotels and apartments is excellent with tariffs to suit all budgets. You'll receive a warm welcome and excellent service wherever you go. Cala Galdana restaurants serve a diverse menu and cater for all tastes. Wine is as pleasing to the palate as it is to the pocket. Essential items can be purchased in the resort but if a greater choice of goods is needed, head for Mahon on market day. If a Cala Galdana holiday appeals but you find the task of trawling through web page after web page looking for the best deal rather daunting, try our simple search facility. You'll find over three dozen travel companies, including leading brands, competing for your custom. It is simple to use, and remember, competition brings out the best bargains. Our search facility enables you to see, at a glance, the Cala Galdana holiday that is the cheapest, and the one that offers the best value for money. It couldn't be easier. All you have to do to secure the holiday is make a phone call. As offers change daily, in order to avoid disappointment, you should ring today.